Serious Johnny fans know that this double header was never issued as a 45 back in the 50's. Great sound quality - light blue Coral labels - a winner! It's strange, the tricks that history plays. 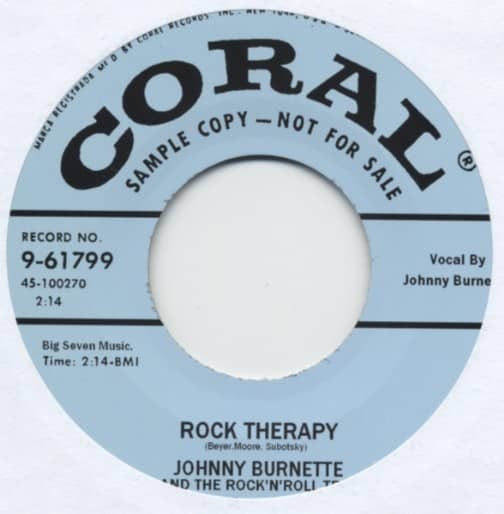 Johnny Burnette, now dead almost forty years, would never have guessed that his legendary status would not be rooted in the handful of hits he scored in the early Sixties, not even in the songs he crafted for Ricky Nelson, but for a handful of sessions he cut in 1956 and 1957. Those sessions resulted in no hits, yet generation after generation turns to them in search of rockabilly's primal yawp. The scorching vocals, stunning lead guitar, even the youthful infighting and jealousies heralded the dawn of a new era. 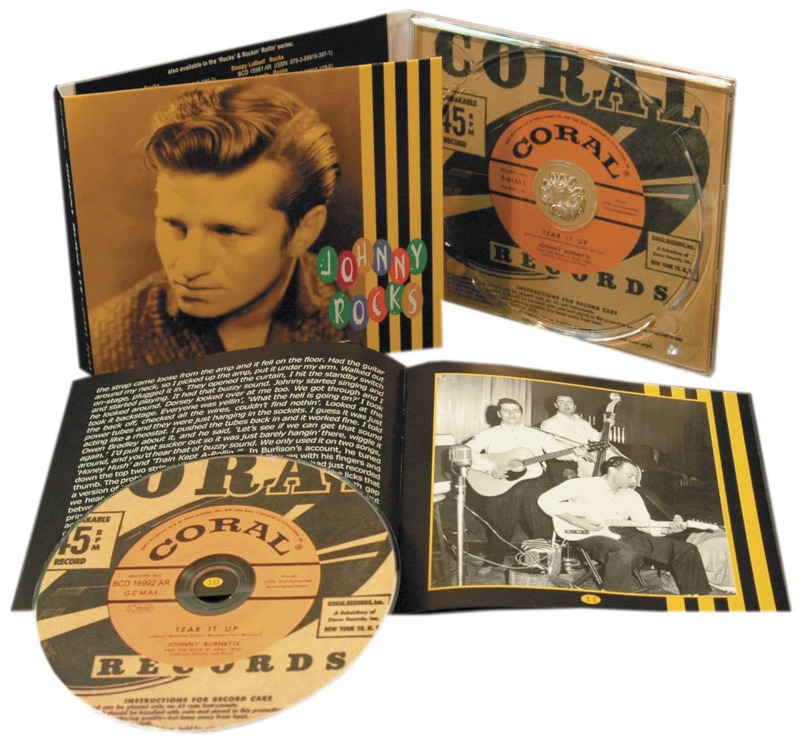 When musicologists deconstruct rockabilly and when revivalists reconstruct it, they're usually trying to unravel the magic of Johnny Burnette and the Rock 'n' Roll Trio. 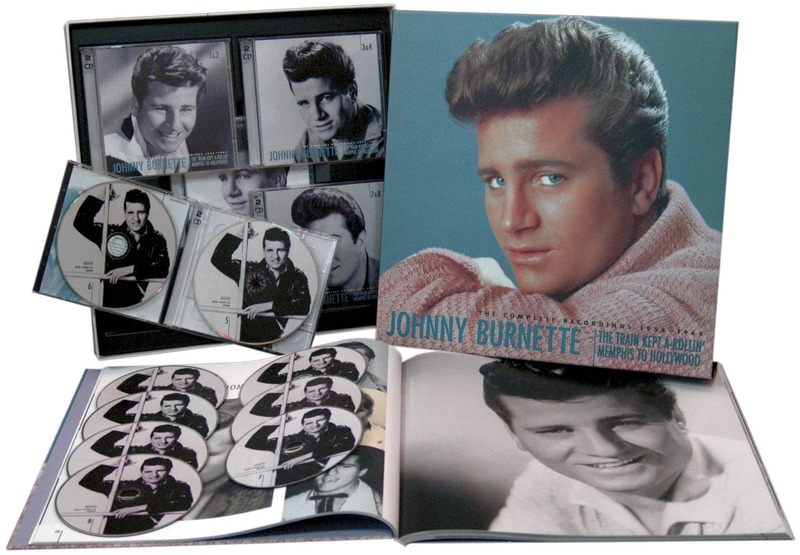 This, though, is the complete arc of Johnny Burnette's career. So much happened in just nine years. The earliest recordings, dating from the last gasp of the hillbilly jamborees, gave way to the fury of the Rock 'n' Roll Trio, which in turn led to the Ricky Nelson era. Johnny tamed rockabilly's fire, but kept enough of the passion intact to make the songs he wrote for Ricky Nelson among the era's most listenable. Then came his own hits, few in number but perfect encapsulations of the era. Finally, we encounter him in search of something new during the first rumblings of the British Invasion. Johnny Burnette's life was short. He not only lived through an amazing transition, but played a pivotal role in it. The Burnettes were well placed to be in the vanguard of the rock 'n' roll explosion. Johnny and his older brother Dorsey were two of the very few Memphis rockabillies actually from Memphis. Dorsey was born on December 28, 1932 and Johnny (or John Joseph to give him his full name) on March 28, 1934 (although when Johnny filled out his application for a Social Security card in 1951, he gave his birthdate as March 25, 1934…and when he became successful on Liberty, he gave his birthdate as 1938). Their parents were Willie May and Dorsey Burnett, Sr. (the 'e' was added later). Dorsey was a distant relative of frontiersman Andy Burnette, who never achieved the legendary status of Daniel Boone or Davy Crockett, but was nevertheless the subject of a Disney TV movie in the 1950s. Dorsey, Sr. and Willie May were from Birmingham, Alabama. Both were stories in themselves. Willie was born on August 11, 1898, but her parents died before she was two years old, and she was fostered out to an aunt who married her off to a traveling evangelist named Sparks when she was thirteen. They had four children, but Johnny and Dorsey barely knew their half-siblings. Sparks took them to California, and they remained estranged from Willie. Apparently, Sparks died insane. When Willie was thirty years old, she met Dorsey Sr., then recuperating from a mining accident. He had been trying to push a fellow worker from the path of an oncoming coal car and had lost part of one hand, leaving just his thumb and index finger, like a lobster claw. Willie nursed him back to health and they married. During the late years of the Depression, they hitchhiked across the country, and, at one point, were picked up by the gangster Pretty Boy Floyd. They spent several days with Floyd in a motel court in Oklahoma or Arkansas. When he left, he gave them fifty dollars, which they had to explain away to the police when they arrived. At some point, Dorsey and Willie moved to Memphis and started a little business selling sandwiches. When Johnny first remembered, they lived in the north end of Memphis. The house was small. "Dad built it hisself," said Johnny. "It looked like a matchbox. You could throw a cat through it." It's possible that the Burnettes actually lived outside the city limits because they don't figure into the city directories from the 1930s. Dorsey Sr. gave Johnny and Dorsey a pair of Gene Autry guitars in 1939. In an unerring foretaste of things to come, they broke the guitars over each others' heads. "Dad went out and bought us two more guitars," Dorsey said later. "He said, 'Learn to play those guitars, you can be like those folks on the Grand Ole Opry.' We started playing parties, little dances, and weddings. We made little or no money, but we had a blast doing it." The Burnettes' hearts were in athletics. Johnny was a linebacker in his high school football team and a guard in their basketball team. "The football team was the lowest class football team in Memphis, but a determined one," Johnny said later. Johnny and Elvis' future bodyguard, Red West, engaged in several knock-down, drag-out conflicts on the football field. Dorsey and Johnny took up boxing on an amateur basis and Dorsey apparently reached the Golden Gloves championships. In 1946-1947, though, Dorsey's career was derailed by a stint in the state training school. He and two others were apprehended and his accomplices went to jail, although Dorsey never told anyone what he'd done. He left school in 1949 and began working joe-jobs to help out the family. Johnny left Blessed Sacrament parochial school in 1948, and went to Catholic High. Customer evaluation for "Rock Therapy b-w Sweet Love On My Mind 7inch, 45rpm"